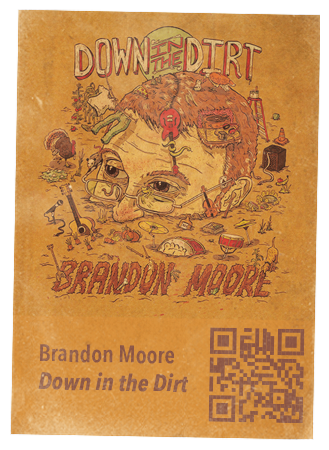 Our featured Listening Room CD this week is, Down in the Dirt the first album entirely composed of Brandon Moore’s original songs, and its very title speaks to Moore’s love for the musical community he’s been grown in. The album is what you would expect from Moore: High-spirited, barefoot-in-the-grass-under-funky-stars, feel-good songs with danceable grooves. But the album also has a lot of heart and depth. It includes the sounds and artistry of moe than a dozen Springfield musicians — a fact Moore is proud to announce with smiling eyes and a happy tug of his beard. Jimmy Rea (of the Hillbenders) partnered with Moore to engineer and envision the record. “Jimmy and I would imagine a song the way we wanted to hear it, and I could think of a particular artist who I knew could match that imagined sound,” recounts Moore, enthusiastically, about his recording process.